HEALTHCARE investigations into deaths, injuries or potential harm to patients are facing severe delays across Northern Ireland, an investigation by The Detail has found. We sent a Freedom of Information request to Northern Ireland's five health trusts asking for a breakdown of the longest time periods taken to complete Serious Adverse Incident (SAI) investigations. An SAI investigation is carried out so that lessons can be learned when a patient is injured or dies while in the care of a healthcare body in Northern Ireland. Department of Health guidelines state that SAI reports should be completed within 12 weeks. The Detail analysed over 100 SAI reports from across Northern Ireland and found that the majority took between one and two years to complete, with one investigation taking almost four years. The data relates to complete SAI reports only and not SAIs still being investigated at the time of our request. The figures show that 15% of these patients and their families were not informed that an SAI had even taken place, while over 40 of the SAI investigation reports were not shared with patients or families. The SAI investigations related to a variety of incidents including suicide and serious self-harm, as well as the deaths of children. Overall responsibility for SAI investigations lies with the Health and Social Care Board. Reacting to The Detail’s findings a spokesperson for the board said: “Whilst timescales for completing reviews are of key importance, there are factors which can legitimately delay the completion of reviews such as availability of review team members or relevant stakeholders or effective service user/carer/family engagement. The board also said that in certain circumstances, such as SAIs relating to child protection or cases of criminality, the completion of reports may be delayed because of enquires being undertaken by other statutory agencies. 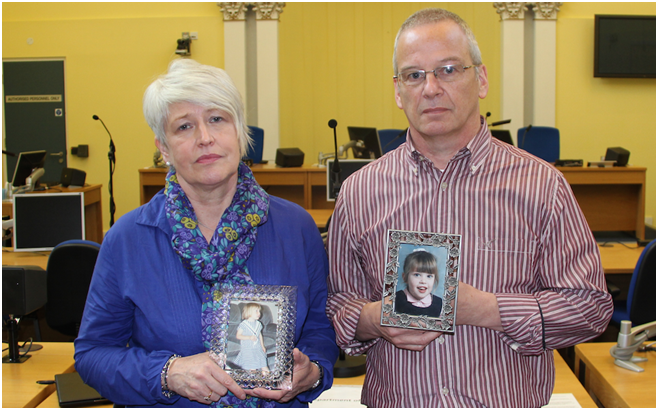 SAI reports developed as an issue of significant interest during Northern Ireland's child fluid death inquiry. The Hyponatraemia Inquiry was first announced in 2004 and examined the deaths of five children. Hyponatraemia is an abnormally low level of sodium in the blood that can occur when fluid is not administered correctly. This can cause brain cells to swell with too much water and in some cases result in death. The high profile inquiry has been hit by a series of delays surrounding the publication of its report. Click here to see a timeline of the key events relating to the Hyponatraemia Inquiry. We contacted the inquiry in relation to the delays we found regarding SAI investigations. In a statement to The Detail the inquiry's chairman Mr Justice John O'Hara said: "The Inquiry report which will be published in the autumn will inevitably deal with this ongoing matter of concern." The figures obtained by The Detail relate only to SAI investigations that have been completed and not those that are still ongoing. Nine-year-old Claire Roberts, who died 20 years ago at the Royal Victoria Hospital, is one of the children whose death is being examined by the Hyponatraemia Inquiry. An SAI Investigation into her death was opened in 2006, but Claire’s SAI investigation will remain “open” until the inquiry publishes its report. Reacting to the figures obtained by The Detail Claire’s father Alan Roberts said: “It is of great concern that some SAIs are taking years to investigate and close out. This is a very difficult and distressing time for any family and such delays greatly compound their stress and anxiety levels. "The fact that an SAI investigation into my daughter's death remains open is one of many serious issues facing the Royal Belfast Hospital around the care management and treatment Claire received and their failure to show openness throughout the last 20 years. During the Hyponatraemia Inquiry hearings health trust lawyers apologised and issued a "full and frank" admission of liability in relation to a number of the child deaths being examined, including the death of Claire Roberts. As well as Claire Roberts, the inquiry also examined the deaths of nine-year-old Raychel Ferguson and four-year-old Adam Strain. It also investigated the events following the death of Lucy Crawford, aged 17 months, and specific issues around the treatment and death of 15-year-old Conor Mitchell. Click here to see The Detail’s previous coverage related to the inquiry. In a series of Freedom of Information requests sent to Northern Ireland’s five health trusts we asked for a breakdown of the top ten longest delays across each level of SAI investigation during the last five years. The information sent to us by the trusts involved 105 cases which were completed within periods ranging from a number of months to years. In recent years a single investigation process for all SAIs was replaced with three levels of investigation. The purpose of a level one investigation is to establish quickly what has happened, a level two investigation involves a more detailed review that should still be completed within 12 weeks and a level three investigation is when independent expert advice is required. Most of the trusts only had a small number of level three SAIs. The Belfast, South Eastern and Southern Trusts were able to provide data over a five year period. However the Northern Trust only provided its information over a three year period and the Western Trust two years. 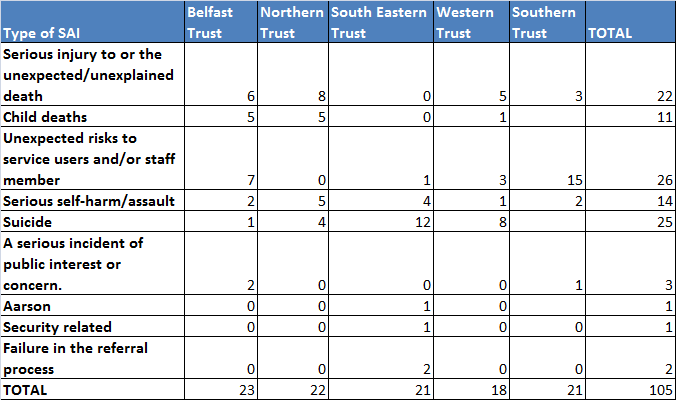 The longest time period for a single SAI investigation occurred in the Belfast Trust at three years and nine months. Unexpected risks to patients or staff members was the most common category of SAI investigation followed by serious injury or unexplained deaths and child deaths. There was one case of a “suspected homicide” in the Southern Trust that took over a year to investigate as an SAI. There was no further information on the case. Of the 105 SAI cases examined by The Detail, 17 patients or families were not informed that an investigation had taken place. Under Department of Health guidelines trusts are required to offer patients or their families an opportunity to engage with SAI process. A number of explanations were put forward by health trusts as to why patients or families may not have been made aware that an SAI investigation had taken place into their case. These included concerns regarding the impact the information may have on people's health and well being. In other cases it was established that no harm was caused and therefore it was decided that alerting relatives or patients may cause “unnecessary distress”. 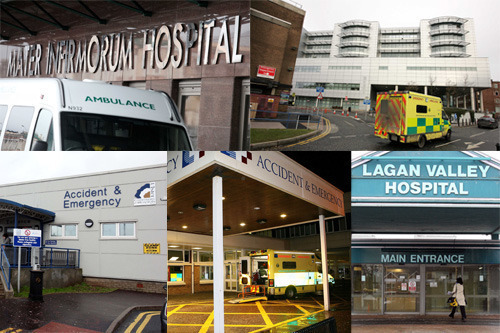 Click here for a breakdown of responses by individual health trusts. In 43 cases the final SAI report was not shared with the patient or their family. The majority of trusts said that in such cases this was because either the family declined direct contact or there were plans for further engagement with the family in the future where the report would be shared. What happens to donated blood in Northern Ireland?